Nothing highlights a season like fresh plant life. I sprinkle small flowers around in glass tumblers (or Mason jars), and usually have one larger arrangement somewhere near the food. It doesn't have to break the bank -- I bought all of mine at my local Trader Joe's grocery store. 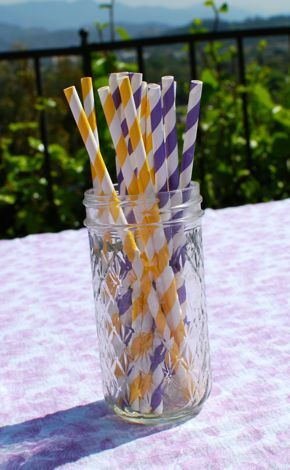 Sweet details like these striped paper straws make guests and family feel like you went all out. I bought mine at Magnolia bakery, but you can also get them online. Glass stemware makes even plain orange juice feel fancy. I dumped store bought berries into pretty soup bowls and instantly the table felt nicer. 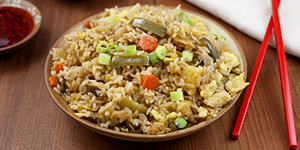 Brunch is my favorite meal to use the fine china. My outdoor table is absurdly long and I don't have a tablecloth big enough to cover it. I pulled a bolt of lightly patterned fabric out of my craft stash and just draped it down the table, un-hemmed and flowing. Likewise, I didn't think we'd have enough seating, so I laid out pretty quilts on the lawn and encouraged guests to make themselves comfortable. 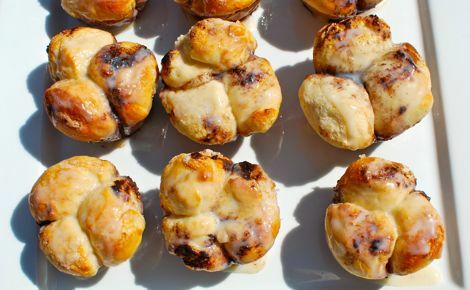 I love to make sweet things for a brunch, these monkey bread muffins are so easy and one of my favorites to make. But I'm not great at the savory or heavier food items expected at a brunch, so one of my guests offered to bring a quiche. It was the perfect complement to the cinnamon buns and coffee cake. A brunch can be as casual or formal as you make it, but the kind I like to host are a little of both. No fuss dress or food, but served with sparkly touches. You don't need a special occasion, you just need an open weekend.